THE MOST INTUITIVE DRAG AND DROP DESIGNER. 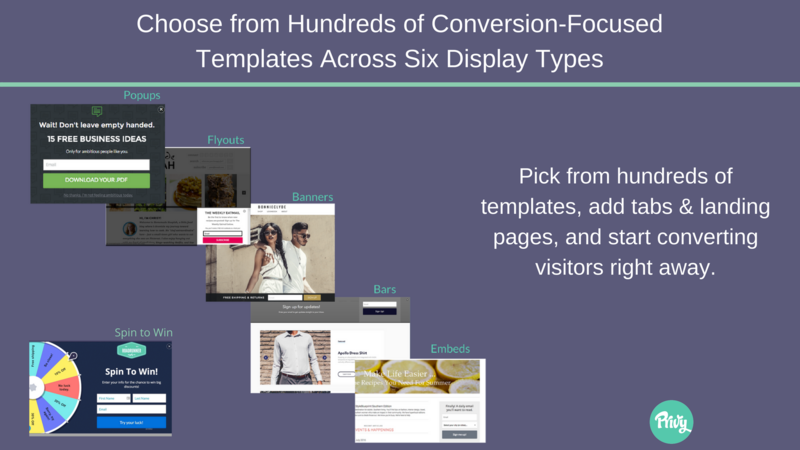 Choose from several on-site display types, then build conversion experiences that fit into your existing site and brand. 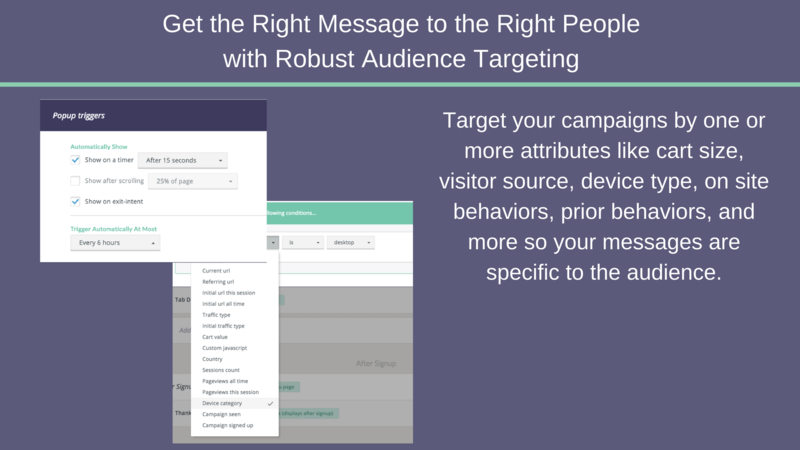 TARGET EACH CAMPAIGN TO THE RIGHT AUDIENCE. Powerful audience targeting features make it easy to serve personal, relevant messages to the precise visitors you need. Target based on exit intent, geography, cart value, referral path, device type and more. LEARN AND OPTIMIZE ON THE FLY WITH A/B TESTING. Set up automated split tests to understand how display type, messaging, triggers or visuals impact opt-in rates. OFFER SINGLE OR BULK COUPON CODES. Easily configure and reveal single use or bulk coupon codes after opt-in. Even enable users to redeem offers on their phones while visiting your brick and mortar store. 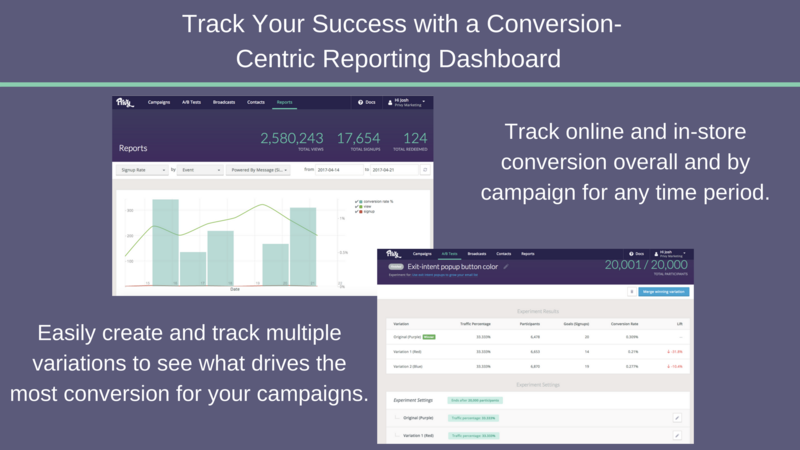 WATCH YOUR RESULTS IN REAL TIME See how each of your campaigns is performing over time and by source, page, display type, and more. Privy is trusted by over 200,000 businesses, small and large, to capture and convert website visitors. 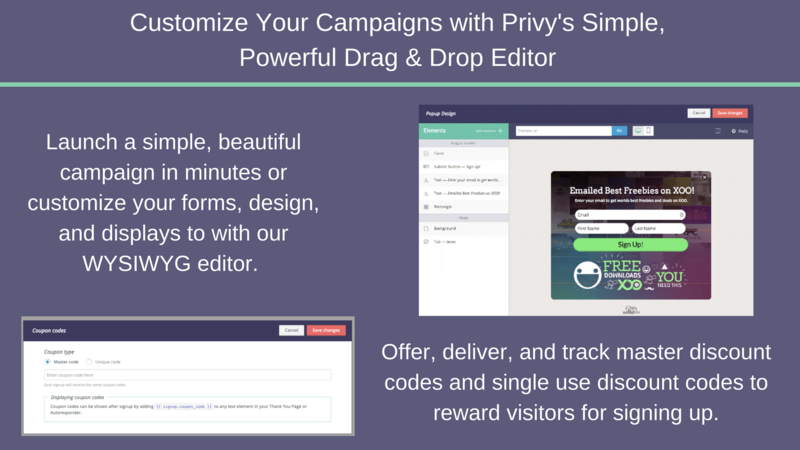 With Privy, you'll never need another popup, coupon or abandoned cart app again. Privy's integration with Volusion lets you set up your account in seconds and get your first campaign live right away, for free. Trigger popups using exit intent, time on site, scroll, cart size, referral source, page URLs, and more. 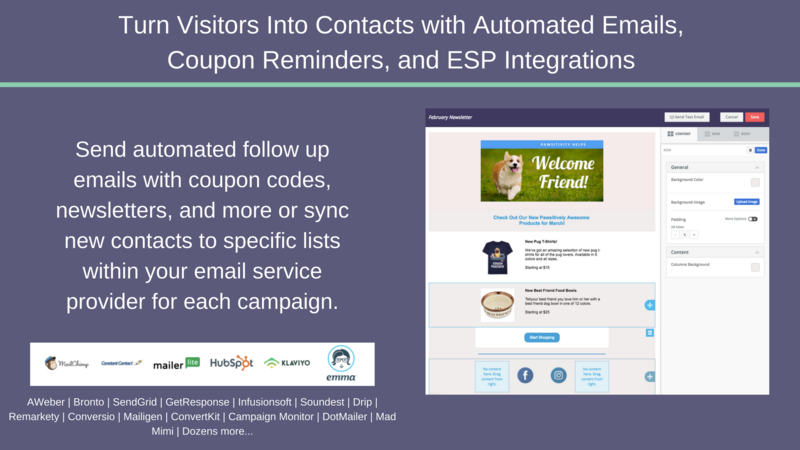 Send automated emails based on visitor behavior, coupon reminder series, and one-time newsletters and announcements to keep your subscribers coming back to your site. Integrated with top marketing and email platforms including Mailchimp, Bronto, Klaviyo, Soundest, Constant Contact, SendGrid, Adroll, Zapier and more.